Whether you're a cruising veteran and have toured the world, or planning your first ocean excursion and hoping to get off the beaten path, Royal Caribbean will take you there onboard Brilliance of the Seas. A cruise on this ship promises a "latitude adjustment," and will take you to locations chosen for travelers with an adventurous spirit. In addition to stopping at exotic locales, the ship provides a variety of onboard activities guaranteed to keep the whole family entertained. The mid-sized Brilliance of the Seas provides the best of both worlds, providing a plethora of entertainment and dining options onboard, while offering the high-quality service and intimate atmosphere of a smaller ship. 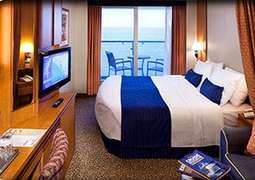 The ship provides all the comforts of home, and much, much more: expect 24-hour room service, a kid-friendly arcade and a climbing wall, and several adults-only bars, clubs and lounges onboard. Brilliance of the Seas is perfect to experience an action-packed vacation without the crowds of a larger ship. There's no shortage of choice when it comes to staterooms on Brilliance of the Seas. 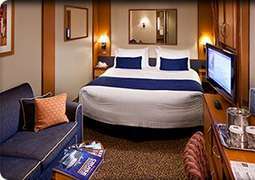 Interior staterooms, featuring two twin beds that convert to a king-size bed, provide a quiet retreat from the action and activity of your days onboard. A more spacious choice, the Oceanview Family Stateroom includes the twin/king-size bed set-up, a separate area with bunks, and a sitting room, and accommodates up to six passengers. 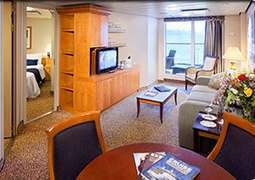 Balcony staterooms are a popular alternative, maximizing your ocean viewing pleasure with floor-to-ceiling glass doors leading from your room to a spacious private balcony. 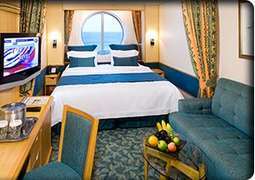 Brilliance of the Seas also has a variety of suites, all assuring maximum luxury and exceptional amenities. As with all things onboard Brilliance of the Seas, Royal Caribbean's program of dining options will leave you in awe. If you're a foodie, you'll be in heaven, whether you choose to indulge in a perfectly prepared steak, a gorgeous assortment of sushi, or the whimsical renderings of the ship's chef de cuisine during a Chef's Table spectacular. Of course, in-room meals are available 24/7 for unwinding and dining in the comfort of your quarters. Taking family-friendly holidays to a whole new level, Brilliance of the Seas presents opportunities for spending time together, kid's independent adventure, and adults-only respite. As a family, you can enjoy pleasures such as arcades, swimming pools, mini-golf, and shows, to name only a few. When it's time for Mom and Dad to pamper themselves with a little quiet time in the adults-only solarium, the young ones will be enthralled with Royal Caribbean's award-winning Adventure Ocean Youth Program, where having fun is paired with learning. Cruise casual is the norm onboard Brilliance of the Seas. If a formal evening is part of the itinerary, most guests opt for suit jackets and cocktail dresses, while a smaller number prefer to go all out with tuxedos and gowns. Casual attire, such as shorts, t-shirts, and caps are not permitted in restaurants in the evening.